You edited a page through the Text editor, but when you switch to Visual editor, some of the HTML you added changes or is removed. This is known to happen specifically when adding Bootstrap Collapsible Accordion Menus and anchors but may happen with other bits of code as well. It also deletes the corresponding </a>. Note that this <a> tag wraps each .panel-heading div. Sometimes when you add an anchor on a page, it will later disappear. This does not happen all the time but it appears to happen by either adding an anchor in the Visual editor, switching to text editor, and switching back to Visual, or adding an anchor in the text editor and switching to Visual. Click Browse next to Revisions in the Publish box and restore the latest version that had the full code (if there are any). Go back and manually re-add the code yourself. If the above suggestions do not solve your issue or you’ve found other code that the Visual editor alters, please email us at webdev@uconn.edu. You’ve inserted a permalink to one page on your site that is supposed to lead to another page on your site. However, when you click the permalink it brings you to a ‘Page not found’ page. If you come across this issue, please email us at webdev@uconn.edu and include a link to your site. You have made changes to a page and clicked ‘Publish’, but when you view the page the changes you’ve made are not there. First, try clearing the cache on the page. To do this, go to the page’s editing screen. 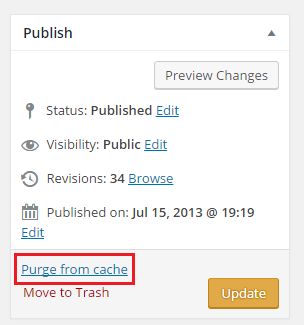 Then in the Publish section, click Purge from cache. If this doesn’t fix the issue, please email us at webdev@uconn.edu and include a link to the page that is not updating.